Over the last few weeks, I was privileged to attend all but one of the commencement exercises celebrated for the graduates of 2014 from our local Catholic high schools. As I reflect upon each of these experiences, I remain deeply impressed with the achievements of our young women and men on many levels. 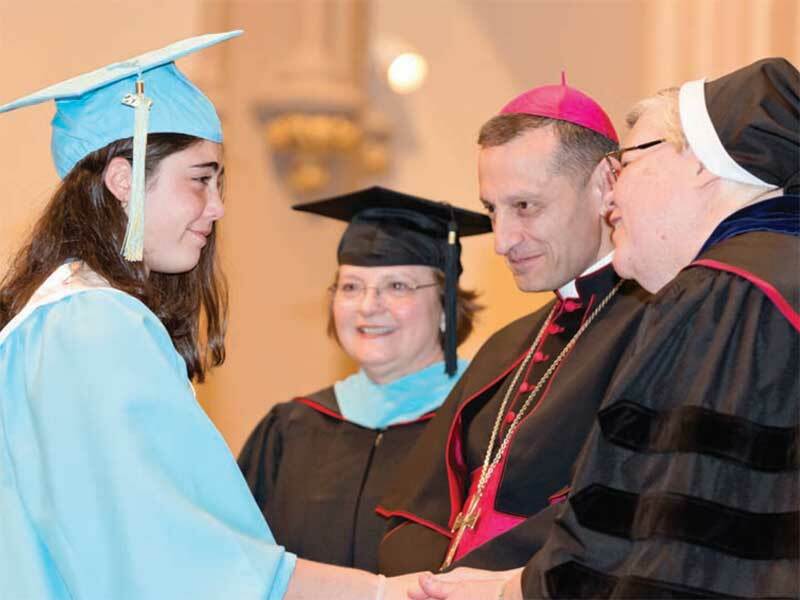 For example, 100 percent of the graduates from Kolbe Cathedral High School, the only urban Catholic high school in the State of Connecticut, will be attending college in the fall. This is a testimony to the wonderful education they received at Kolbe. In addition, while we are still calculating the final numbers for all of our high schools, the amount of scholarship and grant money awarded to the graduates at two of our high schoolsâ€”figures that were announced during their respective commencement exercisesâ€”amounts to nearly $35 million. Moreover, students of every age at each of our high schools have amassed an amazing record of service hours and projects that addressed the charitable and human needs of the poor in our county and beyond! I am proud of all of our graduates. They are the new generation of Catholic leaders who are being sent to college to continue their education so that they can change the world. While their graduation signals the end to an important stage in their lives, it also represents the start of a wonderful journey to greater knowledge and formation. May our Lord bless, protect and guide them in the year ahead. The month of June is also the time for an end and a beginning of certain stages of the synod. On June 21, we concluded our initial listening sessions in every vicariate of the diocese. Your comments, observations and suggestions have helped me tremendously to better understand the current needs and issues facing our diocese. You may see the summaries of these sessions on the synod website at www.2014synod.org/LS. I am grateful to all who attended these listening sessions and who filled out forms online. Your overwhelming interest in the life of the Church demonstrates how deeply you care about our community of faith as it is lived out in our parishes, schools, charitable organizations and throughout the diocese. It is very edifying and gives me great hope for our future! While this edition of the Fairfield County Catholic goes to print, the Diocesan Synod Commission continued its work to summarize all the data received from various venues, with the goal of preparing a summary report that will identify the most important issues raised by the participants. Shortly after the report is finished, I will be able to announce four or five general topics of the synod. The official announcement of the topics to be examined by the synod will take place during the Solemn Celebration of Vespers for the Solemnity of the Apostles Peter and Paul, Sunday, June 29, at Saint Augustine Cathedral at 7 pm. All are most welcome to attend! In a special way I ask that all clergy, religious and the general delegates who will be my closest collaborators in the synod make a special effort to attend this solemn celebration. Let me also share some news with you. Recently, the diocese welcomed Patrick C. Turner as the Deputy Director of the Synod (please see the article on page 3). He will assist Msgr. Dariusz Zielonka in the diocesan Synod Office as Msgr. Zielonka prepares to begin his new position as the pastor of Saint Jude Parish in Monroe. I am thankful to both of them for their willingness to move the synodal process forward in the months ahead. The liturgical committee is already planning the many liturgical celebrations that will accompany the synod and working on creating a comprehensive spiritual program for the diocese, parishes and other institutions. Many thanks to all of them for their service to the Church! These upcoming summer months will be a busy time for those involved with the Fourth Diocesan Synod. They will be working on formation, preparations and as members of the study committees in order to ensure that all is ready for the Opening Session of the Synod on September 19. Let us keep them in our prayers. However, let us also remember to take some time to rest and refresh. Let us remember to spend some time in prayer with Our Lord who is the source of our strength and who refreshes us. God bless you all!